Guest Blooger: Sylvia Trujillo,Chair of the Hispanic National Bar Association’s Project Safe and Fair Elections (Project SAFE). A historic election is just around the corner. The significance for the Latino community will be particularly pronounced and not for the obvious reason. We will learn on November 4th whether or not we as a democracy stand by the fundamental notion that every duly eligible citizen has the right to cast a vote – whether that vote is cast for a Democrat, a Republican, a Green Party member, or a write-in candidate. The National Association of Latino Elected and Appointed Officials (NALEO) and other partners such as the National Council of La Raza (NCLR) have partnered to mobilize a significant number of Latinos to become duly naturalized citizens and to register to vote. Equally important, these organizations have reached out to U.S. born Latinos and urged them to register to vote in historic numbers. The civic engagement initiatives of these organizations and others have held out the promise to the Latino community that all democracies extend the right to vote to all of their citizens and we must exercise that right in order to be heard on issues that matter to us most. In short, we all have been taught that the Constitution and a host of federal laws guarantee that the will of the people will be heard not through violence and lawlessness, but through the ballot box. This is why the burgeoning reports of voter suppression and other tactics to disenfranchise duly registered and eligible citizen voters is so troubling in this election cycle. These reports include efforts to purge registered citizens from voter rosters in violation of federal election law, challenging the rights of registered voters who may lose or have lost their homes due to foreclosure, and the distribution of misleading voter information, for example. The litigation has already begun and Election Day is not yet upon us. Many of these tactics have been used in previous election cycles, but the consequences are pronounced for the Latino population given the large number of new and first time voters as well as the unprecedented turn out of all voters. As it is, the record smashing turn out alone will seriously strain the capacity of most states to administer in an orderly fashion voting on Election Day. Suppression tactics and strategies add further stress to the system. The good news is that there is a broad coalition of nonpartisan grassroots and national organizations that have launched the most ambitious and far reaching voter protection campaign in the nation’s history. The National Campaign for Fair Elections includes a broad array of not-for-profit non-partisan organizations lead by the Lawyers’ Committee for Civil Rights Under the Law. This year the coalition of partners include NALEO, NCLR, the League of United Latin American Citizens (LULAC), and the Hispanic National Bar Association (HNBA). All of the above organizations have dramatically expanded the scope of their efforts to ensure that duly eligible Latino voters, particularly monolingual Spanish-speakers, have advocates available who will assist before and on Election Day. In addition, organizations such as the Latino Justice/Puerto Rican Legal Defense and Educational Fund and the Mexican American Legal Defense Fund, have taken the lead in bringing legal challenges to actions by state government agencies that violate federal and state law and would deny Latino voters and others their right to cast a ballot on Election Day. Members of local and regional Hispanic and Latino legal associations and societies across the country in thirty targeted states are working with local Election Protection Committees along with NALEO and their community-based partners to volunteer at English and Spanish language call centers (1-866-OUR-VOTE (English) and 1-888-VE-Y-VOTA (Spanish) as well as to serve as a corps of mobile legal volunteers responsible for monitoring voting and providing assistance in targeted precincts and polling locations. In short, there is a massive mobilization not only in the Latino community at-large, but among the Hispanic advocates, grassroots leaders and membership, and the Hispanic legal profession. The November 4th Election will be historic not simply because a woman could be elected Vice President or an African American could become President for the first time the nation’s history. On November 5th the Latino community will know whether America’s promise of full participation in the nation’s civics extends to all of its citizens. Nonpartisan election protection knows no party affiliation. Protecting the rights of our citizen’s to vote is about the rule of law, fairness, and ultimately whether or not we believe in democracy. Sylvia Trujillo is a legislative counsel with an association in Washington D.C. She serves as the Chair of the Hispanic National Bar Association’s Project Safe and Fair Elections (Project SAFE). If you are interested in nonpartisan election protection, please visit www.866ourvote.org to obtain more information. We would like to thank Sylvia Trujillo for her participation in our guest blogger series and for her efforts to protect the voting rights of all Latinos in the United States. This afternoon, Department of Homeland Security Secretary Michael Chertoff delivered a state of immigration address. He announced that the agency was formally issuing the Social Security No-Match Rule today and said that, “in the coming days, DHS will return to the District Court to request that the injunction be lifted so that implementation of the rule can proceed.” The “Social Security No Match Letter” regulation directs employers to take certain steps when they receive notice from the Social Security Administration (“SSA”) that an employee’s name and social security number do not match, and to potentially terminate them if the discrepancy cannot be resolved within a short 90 day time-frame. Many lawful U.S. Citizens and those legally allowed to work in our country will be caught up in Social Security no-match letters due to the poor quality of the SSA database. Employers will be overwhelmed with paper work as the government seeks to make employers responsible for the decades old administrative problems. According to the Essential Worker Immigrant Coalition, this initiative is not a positive way to enlist the business community in working to fix the problems that the government created. They claim that the regulation also jeopardizes vital U.S. industries and the U.S. economy as a whole by needlessly creating uncertainties, disruptions, and dislocations throughout in the workforce. Moreover, the regulation would foster anti-Latino and anti-immigrant discrimination and would rely upon a database—Social Security—that is not an effective tool in worksite immigration enforcement. The government defines “reasonable conduct” as seeking to reconcile a no-match letter within ninety days, and if unable to do that, requiring that an employee re-verify his or her work status within three days. If not resolved after ninety-three days, termination is required. There were no such time-limit requirements, no re-verification requirements, and no termination requirements for an unresolved no-match letter before the Final Rule. In a formal letter to The Department of Homeland Security, the United States Hispanic Chamber of Commerce(USHCC) denounced the enforcement of this rule stating that this rule could result in unfair terminations and “will surely result in discrimination.” They added that for fear of repercussions surrounding the rule employers might “steer clear of hiring those perceived to be immigrants.” The letter added that employers might terminate employees if they receive a no match letter immediately rather than deal with the process of verification which would take time and put the employer at risk. The ACLU (American Civil Liberties Union) and others who are against the measure explain that the Social Security database is extremely flawed and that enforcement of this measure could cost employers up to 1 billion dollars per year. The reality is that this is an attempt to curb illegal immigration that unfortunately places an unfair burden on employers. It also puts Latinos who are American Citizens or legal residents at risk for discrimination in the workplace or during the hiring process. Measures such as these cannot compensate for a lack of comprehensive Federal Immigration Reform. It seems that this rule places a burden that belongs that belongs to the federal government in the hands of employers who are already facing hardships given the state of our economy. However, Miachel Chertoff insists this rule simply aims to prevent employers from “burying their face in the sand” when it comes to hiring illegal immigrants. It will be interesting to see how the new president will handle this affair and how immigration matter will be handled by the Secretary of Homeland Security that is appointed in 2009. Can Barack Obama Win the Catholic Vote? Zavala was careful to say that he did not want to take issue with any of his fellow bishops. Indeed his view contrasts with that of others in the hierarchy. But Bishop Zavala’s desire to speak out with an alternative view is a sign of how much has changed in four years: Progressive Catholics are now as organized as conservative Catholics were in 2004. At Web sites such as http://ProLifeProObama.com, they are arguing that the abortion question does not trump all other concerns. The impact of the new Catholic politics could be substantial. Catholics are often a decisive electoral group partly because church membership ranges from upscale to working-class whites, a large group of Latinos, and a significant number of African Americans. Catholics typically make up about a quarter of the electorate, and they are strategically located. White (non-Latino) Catholics are important in such swing states as Ohio, Pennsylvania and Wisconsin, while Latino Catholics make up a notable share of the populations of New Mexico, Colorado, Nevada and Florida. Polls have varied in measuring the Catholic shift toward the Democrats, but Obama seems to be running ahead of John Kerry‘s performance in 2004. According to the network exit polls, Bush carried 52 percent of the Catholic vote to 47 percent for Kerry. By contrast, a mid-October Pew Research Center survey showed Obama leading John McCain among Catholics by 55 percent to 35 percent. Post surveys over the same period have found more modest Catholic gains for Obama. A Post tracking poll released yesterday showed Obama and McCain splitting the Catholic vote at 48 percent each. 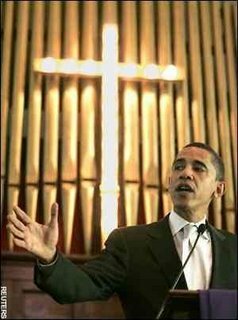 Obama’s Catholic share probably stands somewhere between the Pew and Post numbers. But even a split among Catholics could mark a sufficient improvement over Kerry’s performance to tip key states the Democrat’s way. In many respects, Catholics may simply be a reflection of the country as a whole that seems to be moving toward the Democrats because of frustrations with the economy and the Bush years. New Documentary Urges Minority Women to Vote. The Documentary titled, “Engage Her: Getting Minority Women to Lead and Vote,” features Latina trailblazer, Dolores Huerta and other prominent Latinas such as Maria Theresa Petersen, Executive Director of Voto Latino.The documentary was released by a new organization called Engage Her,it points to the fact that campaigns do not generally target females who belong to minority groups. This has lead to dismal voter turnout among Latino, African-American and Asian women. As a result of this neglect many women choose not to participate because they feel as if their votes do not really count or make a difference. Their lack of participation then results in less policy initiatives that favor minority women and their children, thus perpetuating a vicious cycle that places Latinas at a disadvantage. Engage Her.org is an online organization focused on educating and activating minorities, women and communities to mobilize around issues which impact their lives and communities. Editors Note: On 10/28/08 our newsletter erroneously mentions that Congresswoman Sheila Jackson Lee said that “women need to think globally and act locally.” This phrase was actually said by Congresswoman Barbara Lee. Financing college education is a greater challenge for Latino students than other demographic of students across the nation, according to a study released by the University of California Los Angeles. According to the report, one in five Latino freshmen expressed major concern about the ability to pay compared with 8.6 percent of non-Latino freshmen in fall 2006.Although 60.2 percent of Caucasian students expressed at least some concern about their ability to pay for college, a greater proportion of Latino students were more likely to express such an opinion, with Mexican-American students being the most likely to express concern. In addition to financial concerns, there is also a concern about the lack of Latino males entering four-year universities. Although the number of Latinos entering universities has increased in the past 30 years, the number of males has decreased from 57.4 percent in 1975 to 37 percent in 2006. The national data for the study “Advancing in Higher Education: A Portrait of Latino College Freshmen in Four-Year Institutions, 1975-2006,” came from the Cooperative Institutional Research Program’s annual freshmen survey, administered by the Higher Education Research Institute at UCLA’s Graduate School of Education and Information Studies. This study makes clear that Latinos are greatly concerned about college affordability. In this election year when Latinos are expected to vote in large numbers this is definitely an issue that will be on their minds. Therefore it is important to be knowledgeable on where the candidates stand on this issue that is vital to the progress of the Latino community. Too many programs and a complicated application process deter many eligible students from seeking student aid. The number of programs also makes it more difficult for financial aid officers to help students navigate the process. Consolidating programs will help simplify the administration of these programs, and help more students have a better understanding of their eligibility for aid. Earmarking is destroying the integrity of federally funded research. Billions of dollars are spent on pork barrel projects every year; significant amounts come from research budgets. Eliminating earmarks would immediately and significantly improve the federal government’s support for university research. We have seen significant turmoil in student lending. John McCain has proposed an expansion of the lender-of-last resort capability of the federal student loan system and will demand the highest standard of integrity for participating private lenders. Effective reforms and leveraging the private sector will ensure the necessary funding of higher education aspirations, and create a simpler and more effective program in the process. John McCain believes we should de-regulate the financial aid process and student loan process the same way we did with our banking and housing industries. However it is unclear whether he is willing to commit to increase funding or access to higher education. Furthermore this is an issue that John McCain rarely addresses in his speeches and his platform makes it appear that he is greatly out of touch with the struggles Latinos students face. Support College Credit Initiatives: Barack Obama and Joe Biden will create a national “Make College A Reality” initiative that has a bold goal to increase students taking AP or college-level classes nationwide 50 percent by 2016, and will build on Obama’s bipartisan proposal in the U.S. Senate to provide grants for students seeking college level credit at community colleges if their school does not provide those resources. Barack Obama’s plan is more in tune with the needs of Latino students. His initiative to support English Language Learners is one which would directly benefit Latinos students who speak a second language. With programs such as the American Opportunity Tax Credit he also creates opportunities for young people to learn the value of community service while obtaining a college education. It is uncertain whether in the midst of a financial crisis he will be able to fund programs such as these but his plan addresses many of the needs and concerns of Latinos struggling to finance their college education. Barack Obama’s plan contains greater substance and detail than John McCain’s.This is an issue that Barack Obama has frequently mentioned in stump speeches. John McCain’s lack of mention of this issue could account for the lack of support he has among young voters and Latino voters. In September The Washington, D.C.-based Rock the Vote, a political-advocacy group, conducted a poll that found that young people overwhelmingly support Barack Obama 56 to 29 percent. Meanwhile a new study of four key battleground states by the William C. Velasquez Institute (WCVI), a national Latino non-partisan public policy organization, found that if the election were held today, Latino voters would provide the margin of victory for democratic presidential candidate Barack Obama in Nevada, Colorado and New Mexico. This November, the Latino community has a historic opportunity to play a decisive role in the outcome of the presidential election. In order to meet the needs of the country’s Latino voters, the National Association of Latino Elected and Appointed Officials (NALEO) Educational Fund has launched an unprecedented voter engagement campaign that is changing the face of the American Electorate by increasing Latino voter participation. The Fund’s Voces del Pueblo voter engagement program has contacted nearly one million Latino voters since its inception in 2001, assisted thousands of voters nationwide, and has built local capacity for GOTV work among community based organizations. The NALEO Educational Fund believes that lower voter participation among Latinos is not the result of apathy, but lack of meaningful engagement. Our program seeks to reach historically overlooked segments of the Latino electorate – newly registered voters, young voters, and low-propensity (e.g., infrequent) voters. Throughout the coming weeks, the NALEO Educational Fund and its national and local partners, including Mi Familia Vota and the National Council of La Raza, will be making live phone calls to voters in eight states, including Arizona, California, Colorado, Florida, Nevada, New Mexico, New York and Texas. In all, live phone canvassers will use micro-targeted scripts to reach out to more than 160,000 thousand young, newly registered, and infrequent Latino voters. NALEO’s Voces del Pueblo program is also helping to expand the American electorate through its capacity building initiatives. This year our NALEO Online Voter Software (NOVS) is helping community organizations with limited resources across the country coordinate Get Out The Vote efforts completely online. The software provides organizations access to voter file data and a campaign management interface that allows organizations to customize the list voters and their message to these voters. 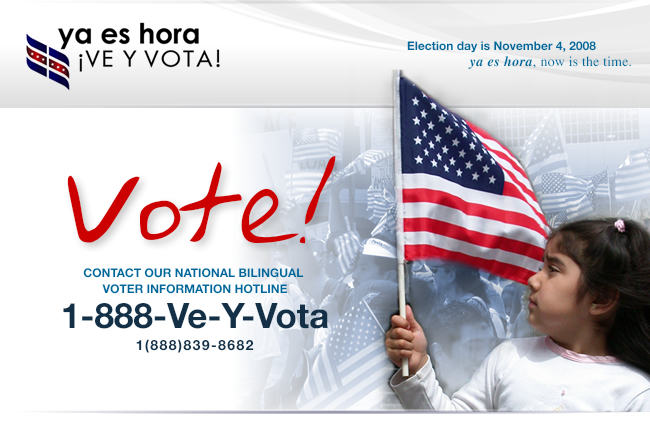 The 1-888-Ve-y-Vota is nationally recognized as the largest live-operator bilingual hotline. It serves as the voter information hotline for the ya es hora campaign and the official Spanish-language hotline for the national Election Protection Coalition. The http://www.veyvota.org web site is one of the most thorough and accessible fully-bilingual voter information websites, serves as a central resource for essential state-specific election information and allows users to locate their polling place and register to vote using an easy to use interface. As the leading organization that facilitates full Latino participation in the American political process, the NALEO Educational Fund will be working arduously to ensure that the there is historic participation in November’s election by the Latino electorate. For more information, please visit www.veyvota.org. The NALEO Educational Fund is the leading organization that empowers Latinos to participate fully in the American political process, from citizenship to public service. The NALEO Educational Fund is a national non-profit, non-partisan organization whose constituency includes nearly 6,000 Latino elected and appointed officials nationwide. Arturo Vargas is a nationally recognized expert in Latino demographic trends, electoral participation, voting rights, the Census, and redistricting.Prior to joining NALEO, Arturo was the Vice President for Community Education and Public Policy of the Mexican American Legal Defense and Educational Fund (MALDEF).Arturo was included in Hispanic Business Magazine’s List of 100 Hispanic Influentials in 1996 and 1998. We would like to thank Mr.Arturo Vargas and Naleo for participating in our guest blogger series and for all of the hard work they are doing to ensure that Latinos all over the United States can exercise their right to vote on November 4th. A voting group that gave overwhelming support to George Bush in 2004 ,now supports the Democratic candidate. In a year when Latinos seems to be leaning towards the Democratic party, this was a group that McCain hoped he could hold on to. They are a minority within a minority but in this year’s White House race between Democrat Barack Obama and Republican John McCain they are also a sought-after swing vote. Latino Protestant voters in the United States are swinging solidly behind Obama, according to a poll released on Thursday by the National Hispanic Christian Leadership Conference, Faith in Public Life and other faith-based groups. Its key finding: that among Latino Protestant registered voters, Obama has 50.4 percent support versus 33.6 percent for McCain. By way of contrast, President Bush by some estimates got over 60 percent of the votes cast by Latino Protestants in 2004, the main reason for Republican inroads with this ethnic group in that election. Sarah Palin was supposed to energize social conservatives to support the Republican ticket but it seems she has not connected with conservative Latinos. Bush’s social conservatism appealed to many Latino Protestants, but the survey found that the perceived hardening of Republican views on immigration had tilted the landscape. Close to a quarter of America’s 45 million Hispanics are Protestant, according to some estimates (most are Roman Catholic), amounting to close to a third of the Latino electorate because of demographic and other social factors. Many are concentrated in closely contested states such as New Mexico and Colorado. The nationwide poll was conducted by SDR Consulting from Oct 1 to 7 and included 500 self-identified Hispanic Protestants . It has a margin or error of +/- 4.4 percentage points. This coincides with polls that conclude that overall ,Latinos are leaning towards Barack Obama. Many point to the fact that Latinos have been alienated by the Republican party’s stance on immigration to explain their support of Barack Obama. However, it can also be argued that Latinos like other Americans are concerned about the economy and are unhappy with the policies of the last eight years. Perhaps Latinos like other Americans tend to prioritize their financial concerns above other issues such as abortion or gay marriage and this is why they are choosing to support the Democratic ticket this election year.